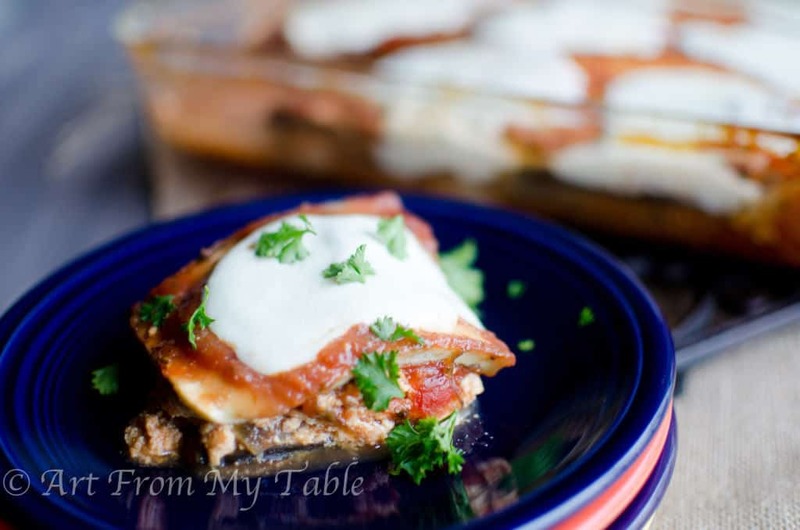 Eggplant Lasagna gives you all the wonderful flavor of traditional lasagna without the carbs. This vegetarian dish will surely satisfy. 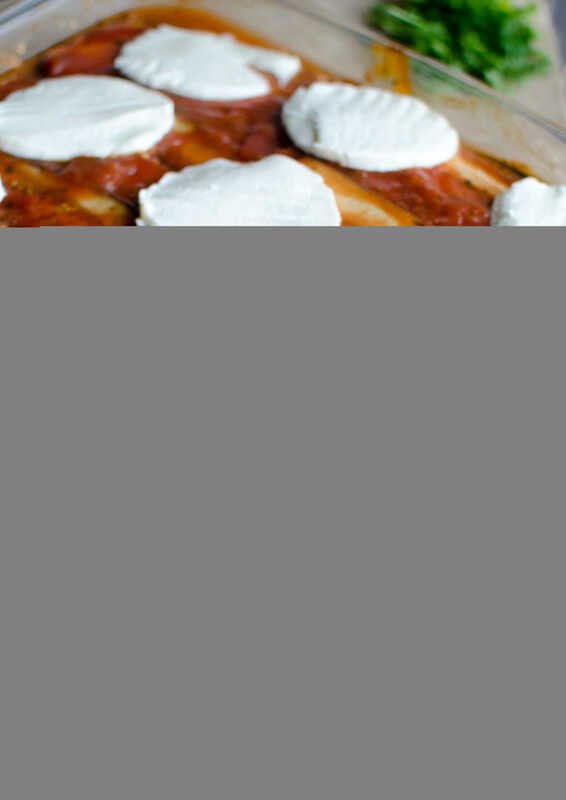 Who doesn’t love a traditional lasagna full of cheesy goodness and Old World Italian flavor? Served up with some fresh bread? Mmmm! However, it’s January, it’s the time of year that most of us are trying to cut back on the calorie intake. We might have indulged over the holidays, or maybe you didn’t, but you’re just ready for some good nutritious whole foods. Well, I’ve got the answer for you. Eggplant Lasagna! This dish is feels like comfort food, but without the heaviness that it can sometimes leave. Watching your carbs? Gluten Free? This recipe is for YOU! I’ve sliced up an eggplant lengthwise, this is going to be our pasta substitution. Eggplant, when cooked has sort of a nutty flavor. It adds a beautiful flavor to this Italian dish. I like to use a mandoline slicer to get my slices exactly the same size, but it’s not necessary. And if you’re not familiar, a mandoline is a type of slicer, as mentioned, not an instrument. I can’t quite figure out if I’ve got some professional term or if I’m completely behind the times, but when I mention this to people, they often times don’t know what I’m talking about. Hmmm…. So, I slice them to about 1/8 of an inch. You want it thick enough to hold up, but not so thick that it feels too firm. 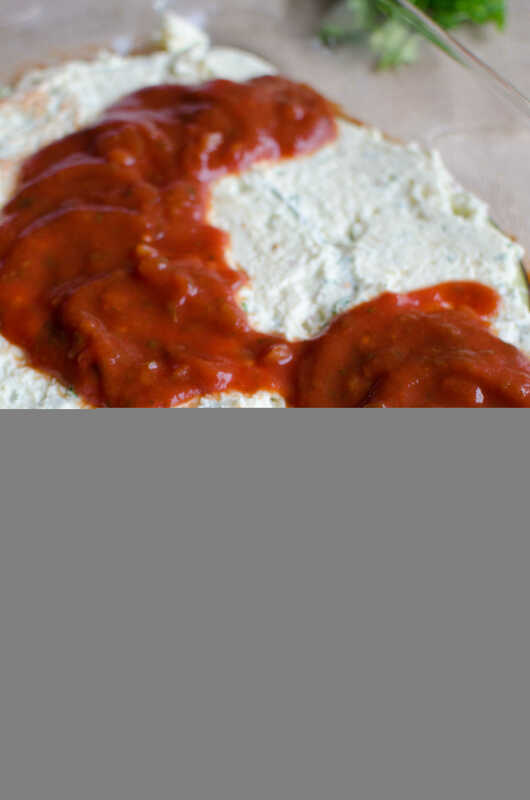 You can use your own homemade sauce or feel free to buy a jarred sauce to make it easier. When buying a jarred sauce, I look for something that is all natural and that doesn’t contain any artificial ingredients or preservatives. Combine some ricotta, mozzarella, and parmesan cheeses (cheesy goodness) with a couple eggs and some parsley. For the exact measurements, see the recipe card at the end of this post. Once you have your cheese combined, it’s time to put it all together! Start with about a cup of sauce in the bottom of your pan. Layer the eggplant slices, just as you would the noodles if you were making traditional lasagna. Once the first layer is down, top it with half of the cheese mixture, spread it evenly across the eggplant. More sauce goes on top of that. Add another layer of eggplant, the rest of the cheese and more sauce. Finish with one last layer of eggplant and sauce. To bake, cover it tightly with foil and put it in the oven for about 45 minutes. At that point, remove it from the oven, and top it with some fresh mozzarella rounds. 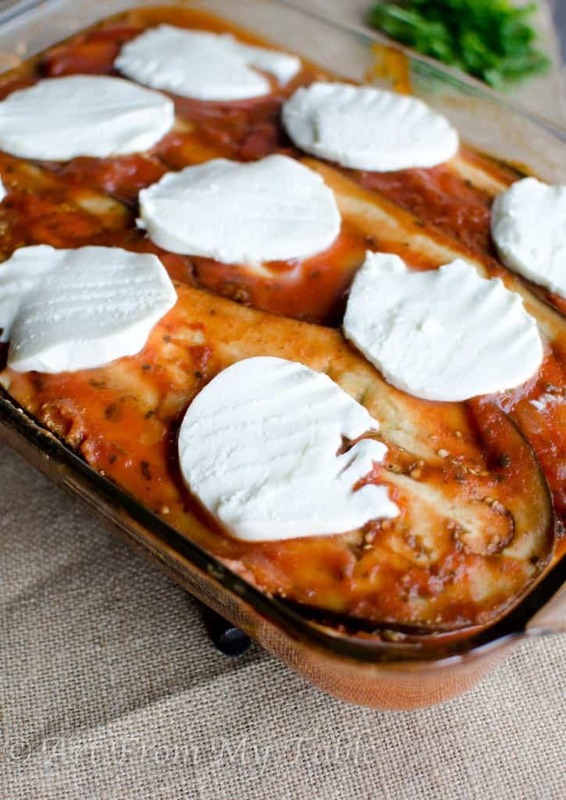 Eggplant Lasagna goes beautifully with a nice green salad, or some roasted green beans. If you’re looking to get even more greens into your dinner, you could mix up some chopped spinach into the cheese mixture. I’d recommend using fresh spinach as opposed to frozen, then you don’t have to add the extra step of squeezing the excess water out. Plus, eggplant has a good amount of water in it already, so this will help it avoid having too much liquid. 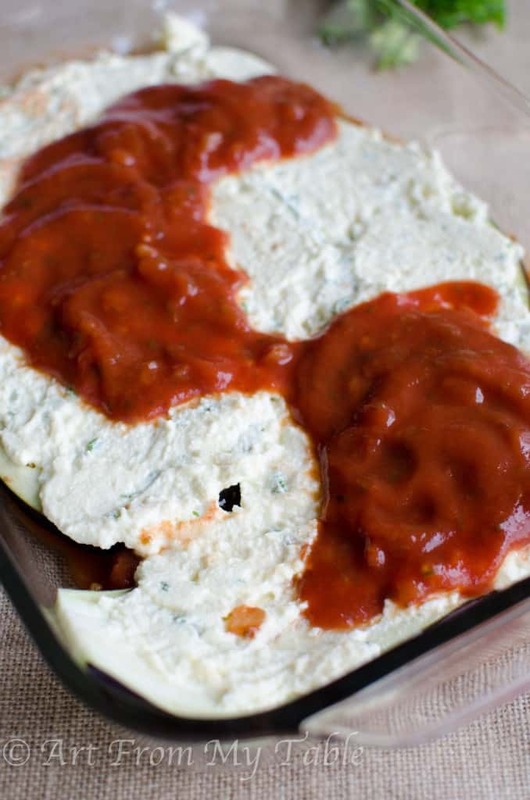 You could even just layer some spinach over the cheese before adding the sauce. Lots of versatility here! 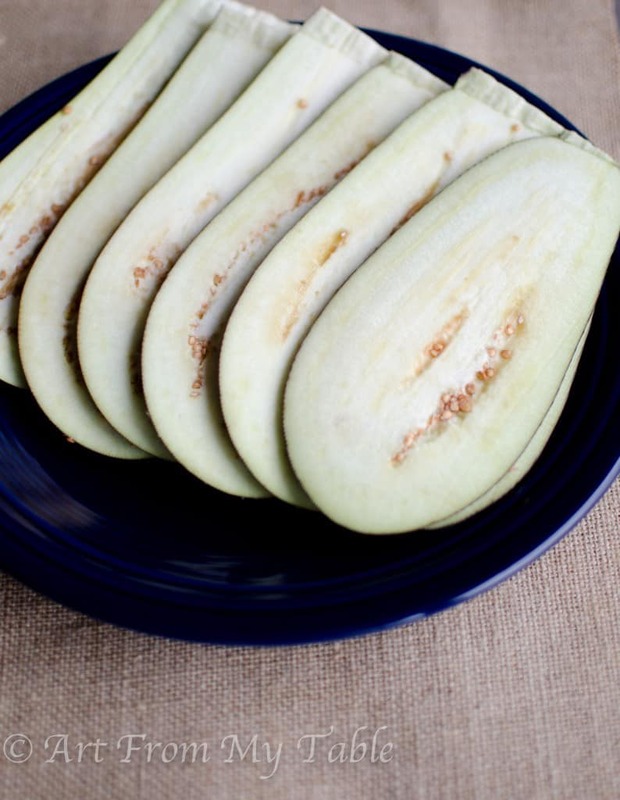 Slice eggplant lengthwise into 1/8 inch strips. Lightly salt the eggplant and carefully place it in a colander, this will extract some of the excess water from the eggplant. Let it sit for 20-30 minutes. Combine Ricotta, shredded mozzarella, parmesan cheese, eggs and parsley, mix well. Pour 1 cup of sauce on the bottom of a 9x13 inch pan, spread evenly. Lay the eggplant slices across the sauce, as you would noodles. Spread half of the cheese mixture on top of the eggplant, then top with more sauce. Repeat steps 6 and 7 one more time. 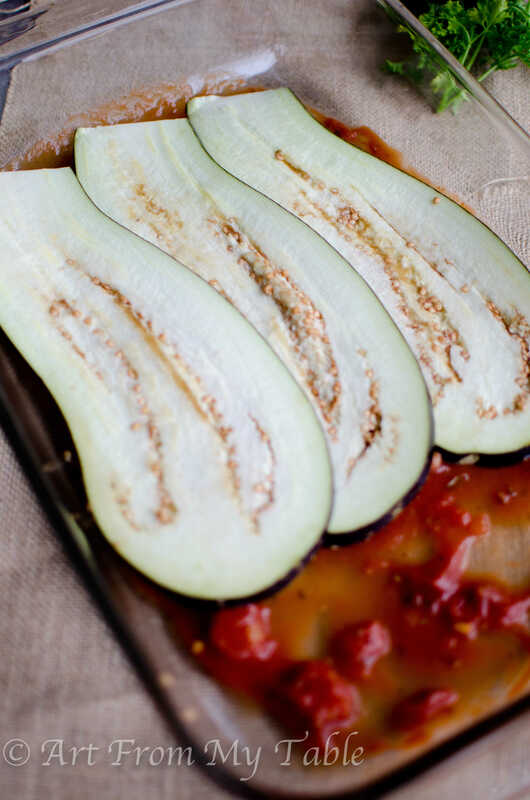 Finish with a layer of eggplant and sauce. 10. Cover tightly with foil and bake for 45 minutes. 11. 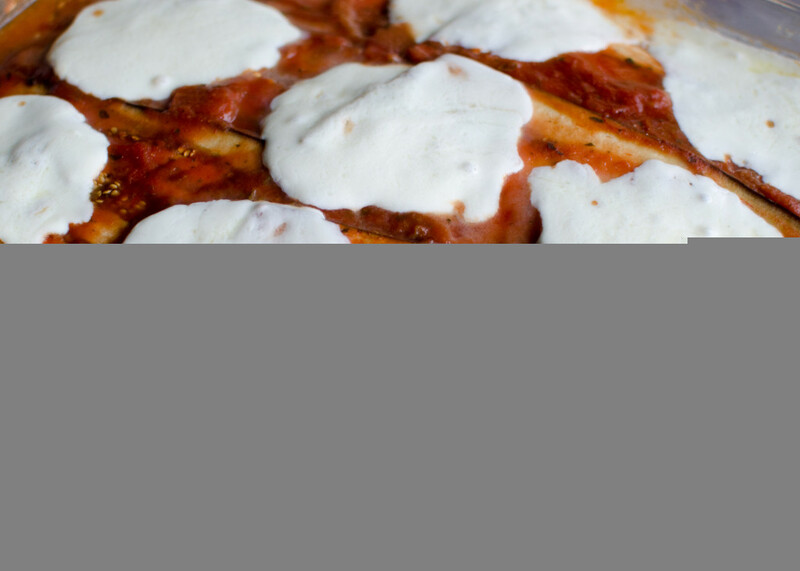 Remove foil, add fresh mozzarella rounds, and bake for an additional 5-10 minutes until cheese is melted.